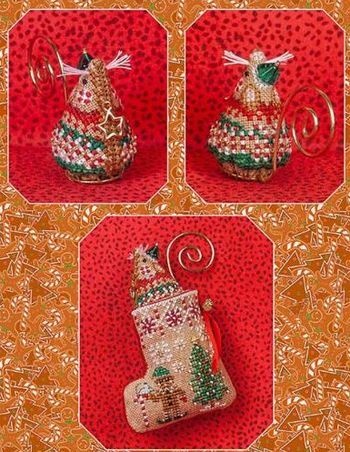 A limited edition ornament, Gingerbread Elf Mouse is stitched on either 32ct Antique Almond linen by Zweigart, or 32ct Gingerbread linen by Picture This Plus. Stitch count is 57w x 28h, design size is 3.5" x 2. Kit includes hanger for tail, antique brass button for base, beads, green glass elf hat and gold star charm. You supply the linen and floss.